In 1978, after twenty years practicing law in Statesboro, Edenfield was appointed to the federal bench by President Jimmy Carter. He also served in the Georgia Senate from 1964-1966. In 2008, Edenfield received the Distinguished Service Scroll Award, the law school alumni association’s highest honor. 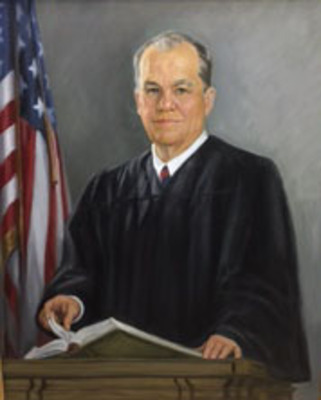 The portrait was presented to the U.S. District Court in 2004 and hung in the courtroom formerly used by Edenfield, before being donated to Georgia Law. The school has established the B. Avant Edenfield Jurist in Residence program thanks to the support of Allen W. Yee (J.D. '03), a senior attorney with the Coca-Cola Co. and a former clerk of Edenfield.